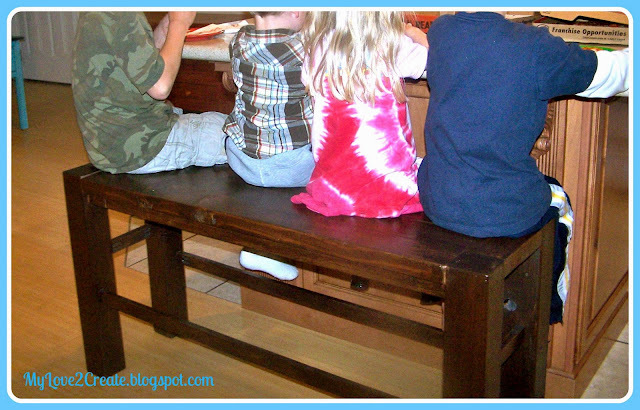 With kids that can't reach into cupboards I find myself tripping over barstools ALL THE TIME in my kitchen. Instead of 4 barstools, that find several random homes throughout the day, I decided we needed a bench at the counter. Since I have no money to buy one, why not build one? I looked on Ana's Site but could not find any benches that were counter height. 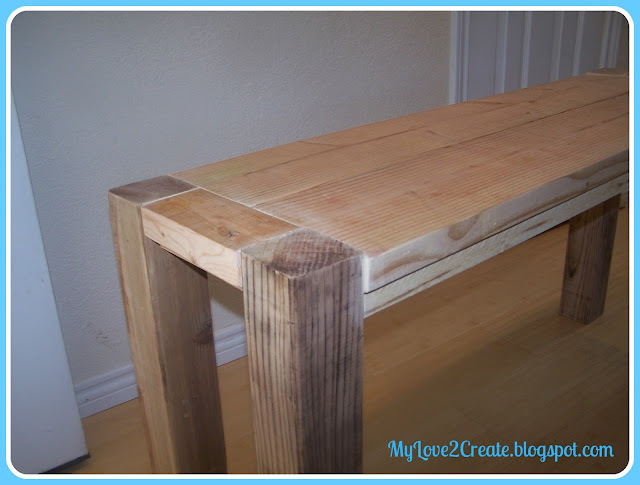 I did find a bench I loved though and decided that I could attempt to modify it... I tried it and it worked! Here are the plans I modified. 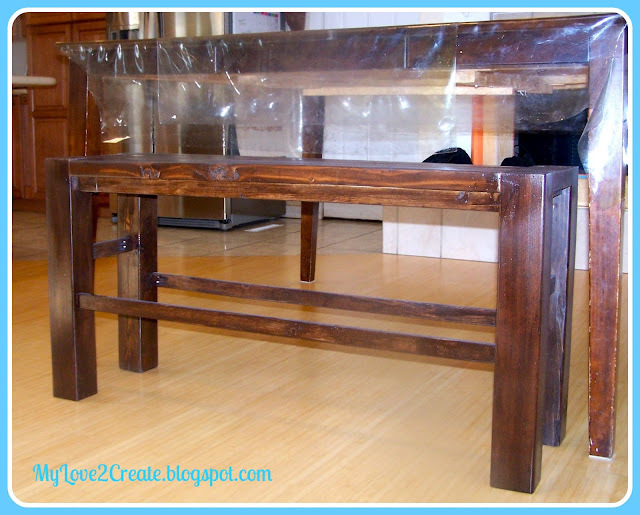 If you have been reading my other blog posts you are starting to see that most of the things I build are built mostly with free wood I get off craigslist. 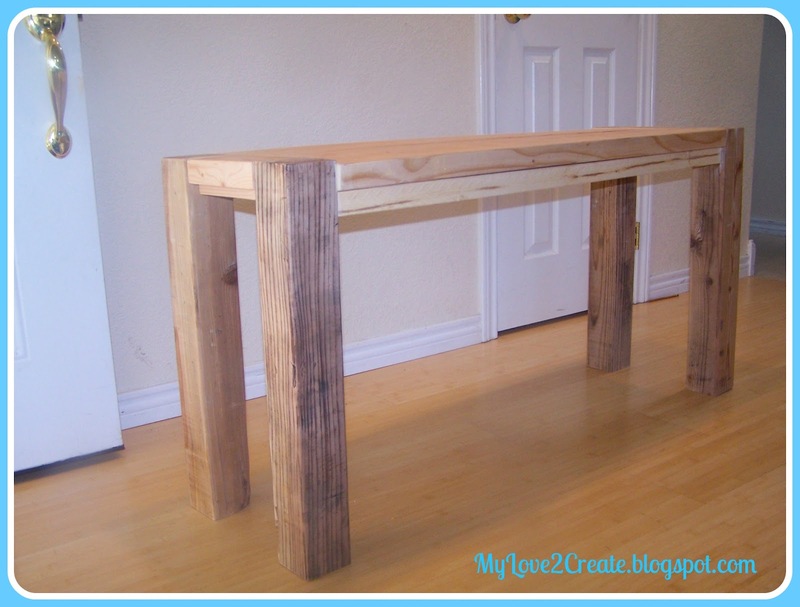 The same goes for this bench, it is build out of reclaimed wood, nothing is better than free! Here is the bench right after I built it. Now we have no need for the blue plastic stool to get up! 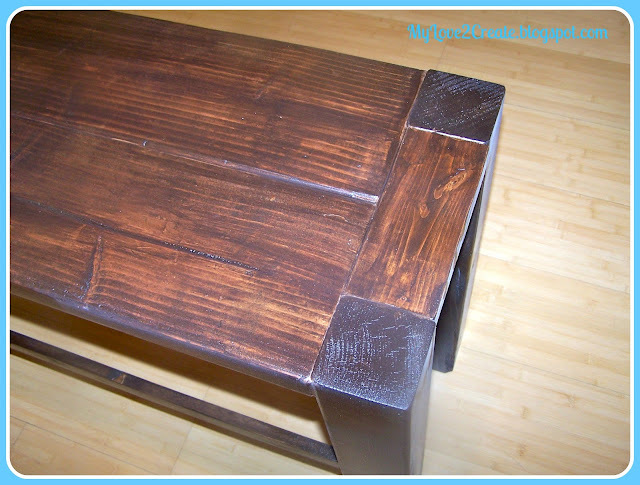 So I stained this bench in Rustoleum Dark Walnut. I also stained the tops of my end tables at the same time. Up to this point in my life I had never stained anything before. Looking back I think I would have rubbed the stain off a little sooner....but I still LOVE this bench! well...with six of them, it's not wonder you're tripping over them. 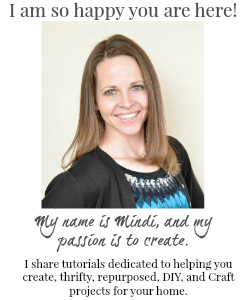 You are awesome Mindi! Wow! Ambitious! Turned out awesome. I've also got a house full of kids constantly getting tripped over. And do you mix up their names too? It used to bug me so bad when my mom would do that, and now I do it too! 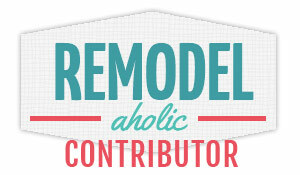 Thanks for coming over and commenting on my blog, so I could be introduced to yours! Great job! Can you give the measurements and board sizes? I'm hoping to build something similar. I was wanting to make the same thing but was worried about tipping (I have six kids too! - lots of unexpected spills). 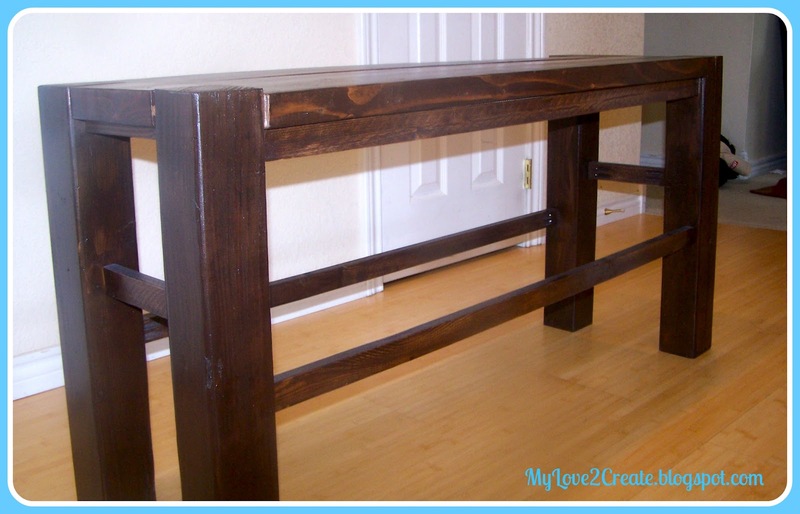 Is it heavy enough to stand or a little top heavy - maybe needing a slightly wider base? Please let me know your experience with it - I am having visions of kids spilling on the floor. Did you ever write out your modified plans?! My husband is planning to make us a counter height bench this weekend, and I'm sure tried and true plans would be s lifesaver!! 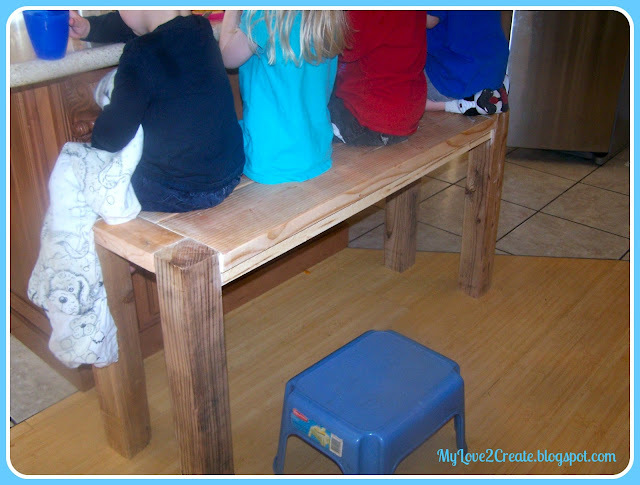 PS Thanks for sharing this, before I saw this I didn't even know if a counter height bench was feasible (I thought it might be too tippy)! Did you ever post your how to? I am new to all this and love this bench! 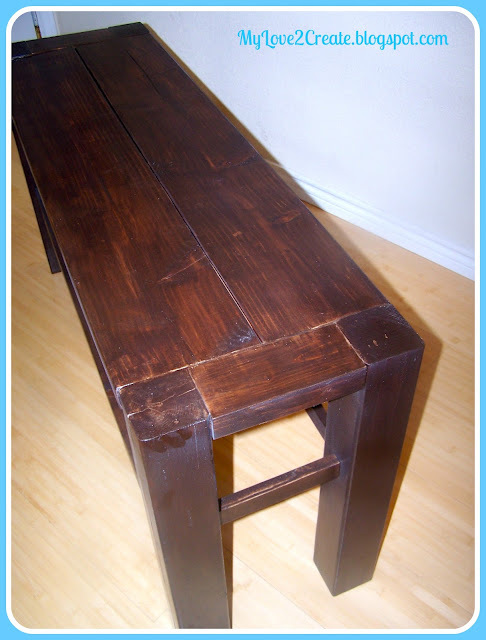 I need a counter height bench but need specific plans. Any help is so much appreciated!